On the frustratingly long drive home from Ann Arbor on Sunday, my brother and I got into a long discussion about Denard Robinson, in which he deemed Robinson a "turnover machine", and further still, declared he didn't want to see Robinson under center anymore. He had given up. I can't say I blame him, but I disagreed, despite the mass of evidence in his corner. Robinson has thrown 4 INTs on only 21 pass attempts. That's Josh Nesbitt bad. Further, he's lost at least three fumbles that I can remember (of course, absolutely no one keeps individual fumble statistics and I can't remember exactly how many he's lost) and put the ball on the ground a number of other times. Denard has done little to inspire confidence, but despite all of that, I still want to see him in the game. Robinson is a true freshman, and if we learned anything from last year, it's that these freshmen from the warmer tropics of Florida take some time to get adjusted to the cold and rain of the Midwest (just last week, Odoms proved he still wasn't over his fumbly ways on punt returns). The fumbles, though, from comments made by Rodriguez and Robinson seem to be fundamental things that are just going to need to get ironed out, sooner or later. Denard appears to be waiting just a bit too long to secure the ball. He's carried the ball 51 times and put it on the ground 3-6 times. Those are bad numbers but ones that are probably correctable. The interceptions are a different story. On 21 attempts, Denard has thrown 4 INTs--one, I'm not entirely sure was his fault. This week's pick almost certainly was. I'm going to have to watch it again on film, but it looked to me like Denard misread the coverage, Penn State slipped their corners into a short zone, and Denard bit on the look. I'm fine with deploying Robinson, but Michigan has to be more flexible with him. The difference between second and nine, when a Robinson run is still a plausible threat, and third and nine, when it isn't, is obvious: second down is an open seam that Koger (argh) drops; third down is a horrible interception. Bringing Robinson in is fine—he was effective, the third and long was the result of a penalty and a drop—but once it's a passing down, Forcier's got to come in. I don't know that I wholly agree with this. 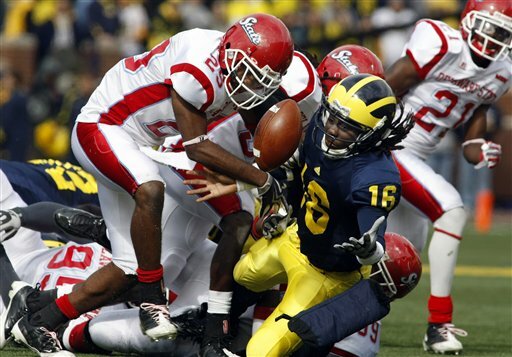 Let's look at Denard's passing credentials: A true freshmen, dual threat quarterback who completed under 50% of his passes in high school and has thrown, against non-Delaware State competition, 17 collegiate passes. So insofar as Denard shouldn't be in the game on third and long, I can agree with Brian. But the more important point that he doesn't address is that Robinson is clearly not being given the same playbook as Forcier. All season, we had heard that Denard/Tate/Sheridan were being given the same playbook; they're all quarterbacks and will all be treated as such. And yet after the Michigan State game, you get quotes from MSU players that say things to the extent of "80% of the time Denard is in the game they run the ball. They did it here too." Denard Robinson is not yet a passer, but exclusively running the ball with him on first and second down is a bad idea. We've seen that on plays with simplified reads, Denard can make some good throws--he did so against Iowa, Indiana, and Western Michigan. These plays need to be run early and often in Denard series. To say, "Run the ball until you don't think you can get a first down. Then throw for the first down." is unfair and unwise. Denard needs more of the playbook, least of all, to the keep defenses honest. So Rodriguez needs to put him in a more realistic position to succeed. The way he's been deploying Denard--giving him complete series instead of just using him as a change-of-pace quarterback like he was used early in the year--is not particularly well planned. I mentioned before the Delaware State game that I wanted to see Denard given the full playbook. He wasn't, and only attempted four passes in a game when he should've thrown the ball 15-20 times. So Denard may be a turnover machine right now, but that's only because he's being forced into positions where, unless he defies logic and data, he's going to fail.